Zip Cruncher is a potentially unwanted program that claims it is a ZIP archive utility, but also installs unwanted extensions, adware, or unwanted programs onto a computer. Programs that are installed include are adware program called AppMaster and AppSync, and the Normandoh.com hijackers for Internet Explorer and Edge. How was Zip Cruncher installed on my Computer? 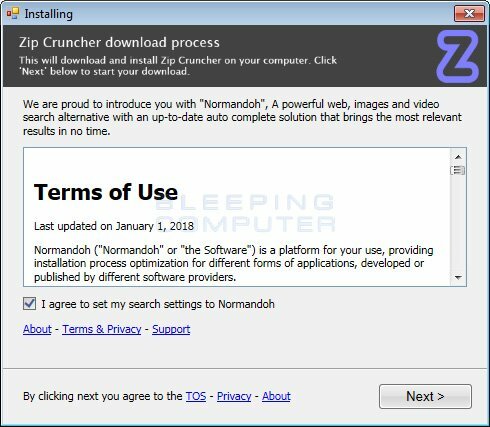 It is important to note that Zip Cruncher is typically bundled with and installed by free programs that did not adequately disclose that other software would be installed along with it. Therefore, it is important that you pay close attention to license agreements and installation screens when installing anything off of the Internet. If an installation screen offers youÂ CustomÂ orÂ AdvancedÂ installation options, it is a good idea to select these as they will typically disclose what other 3rd party software will also be installed. Furthermore, If the license agreement or installation screens state that they are going to install a toolbar or other unwanted adware, it is advised that you immediately cancel the install and not use the free software. If you are not sure how Zip Cruncher was installed on your computer, then it most likely was installed via an adware bundle. As this program is installed without your permission, connects to remote sites without your permission, and perform unknown activities, it is suggested that you remove it. To remove Zip Cruncher you can use the removal guide below to remove it for free. Once it is downloaded, double-click on the iExplore.exe icon in order to automatically attempt to stop any processes associated with Zip Cruncher PUP and other malware. Please be patient while the program looks for various malware programs and ends them. When it has finished, the black window will automatically close and a log file will open. Please review the log file and then close so you can continue with the next step. If you have problems running RKill, you can download the other renamed versions of RKill from the rkill download page. All of the files are renamed copies of RKill, which you can try instead. Please note that the download page will open in a new browser window or tab. Your computer should now be free of the Zip Cruncher PUP program. If your current security solution allowed this program on your computer, you may want to consider purchasing the full-featured version of Emsisoft Anti-Malware to protect against these types of threats in the future. While Emsisoft Anti-Malware, Malwarebytes Anti-Malware & HitmanPro will scan and clean a computer for free, the free versions do not offer real-time protection. If you want to be fully protected at all times then it is recommended that you purchase a premium version. Purchase the full-featured version of Emsisoft Anti-Malware, which includes real-time protection and behavior blocker, to protect yourself against these types of threats in the future!